The Apache Trail is one of the most famous and scenic drives in Arizona and is now an established historic route. Its 47-mile length begins at Apache Junction and winds past the Superstition Mountains, through Tonto National Forest, with views of three lakes, cliff-dwellings and many other points of interest along the way. Teddy Roosevelt played an incremental role in the development and preservation of the Apache Trail. He once described it "as one of the most spectacular, best-worth-seeing sights in the world." Around 900 AD, Salado Indians occupied the area surrounding the Superstition Mountains and created many trails which were later used by the Apache to raid villages along the Salt River. It wasn't until 1903 that the Apache Trail was developed and used to haul supplies from Mesa to Roosevelt Lake for the construction of the Roosevelt Dam, which would bring water and electricity to the Salt River Valley. Today, the Apache Trail is traveled by tourists from around the world. It is only a short drive from Phoenix and makes an excellent day trip filled with beautiful vistas of the Sonoran Desert. I was lucky enough to have an extra day to visit the Apache Trail during a short three-day visit to Phoenix. It was also my first experience in the desert during a rainstorm, something I have always wanted to witness. After a rain storm, the desert is fresh with color and depth. Each leaf, thorn and stone becomes a significant element in a brilliant scene of survival. Droplets of water cling to normally dry stems, dancing with light, capturing flashes of red, green, white and blue. The golden soil, saturated with moisture, serves as an underlying canvas painted with towering green Saguaros, abundant Creosote and elegant Jumping Cholla. 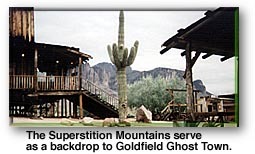 The first raindrops struck the desert as I drove into the once-booming gold mining townsite now called Goldfield Ghost Town. It was a rich gold strike that led to the establishment of Goldfield Mining District in 1892, and old buildings still line the dirt road. The rain didn't keep me from taking a quick walk down the center of town while I imagined what it was like when the famous Mammoth Saloon was filled with boisterous prospectors telling drunken stories of lost mines and desert lore. My eyes wandered from building to building, reading the names of each establishment: Goldfield Livery, Lost Dutchman Museum, Coffee Cantina and Bakery, Rock Shop, Live Rattlesnake Exhibit, and Gold Mine Tours. I found my gaze returning to the dark and forbidding Superstition Mountains, which were shrouded in fast moving clouds. This 160,000-acre mountain range has a history of legends, mystery and lost gold mines. 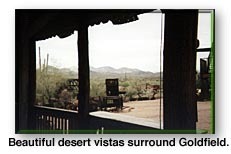 The most famous story associated with the area is the Legend of the Lost Dutchman Mine. The rain continued, and I decided to drive a half mile further down the road to the Lost Dutchman State Park, where numerous hiking trails led into the mysterious Superstitions. By the time I arrived at the Ranger Station, the rain was coming down in sheets with such force, it felt like hail. 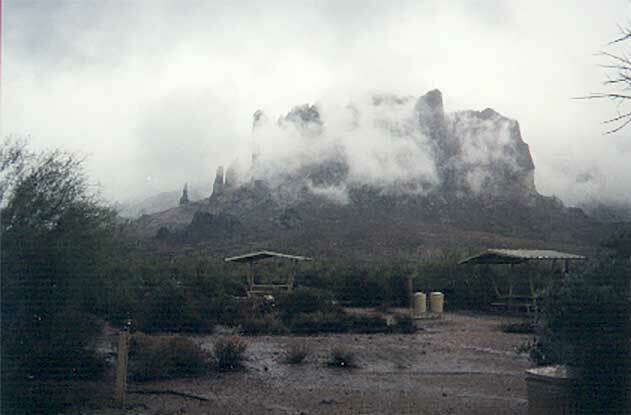 At the foot of the 3,000 foot high Superstition Mountains, the Lost Dutchman State Park's 292 acres seemed minuscule. The scenery enveloped the park with each view, magnificent light green Cholla, bright Palo Verde trees and dark varnished rocks filled the landscape. The wind blew the stormy rain-bearing clouds eastward, and I followed in my car, catching glimpses of a freshly watered desert as I entered Tonto National Forest. Eleven miles from the park, nestled between mountains and volcanic rock, lies Canyon Lake. 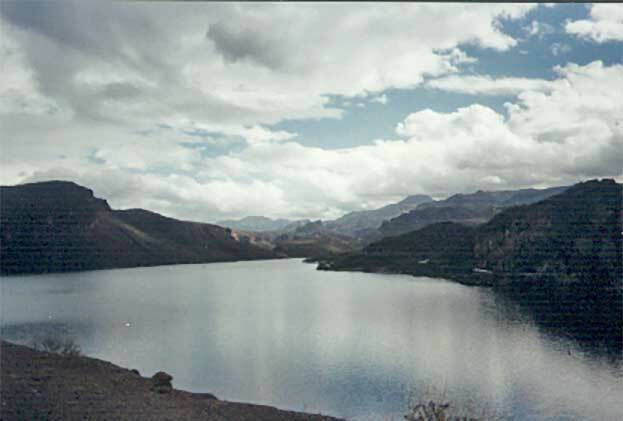 Canyon Lake was formed in 1925 when the Mormon Flat Dam was completed. The beautiful lake provides a refreshing retreat from the desert sun, when it is shining 300 days of the year. Canyon Lake has a marina, restaurant and the well-known "Dolly," which provides steamboat cruises on the lake. Two miles farther down the Apache Trail lies Tortilla Flat, an old stage stop which was built in 1904 as a rest area on the way to the construction site of the Roosevelt Dam. During its boom era, the tiny town had 125 residents, a school, church, post office, hotel, livery, general store, saloon and a restaurant. In 1942, a devastating flood swept through Tortilla Flat, destroying many of the homes and most of the town. 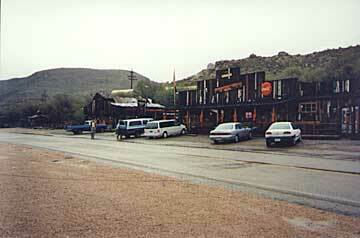 Today, when you drive into Tortilla Flat, you enter another era -- a remnant of the past. Since the big 1942 flood, a small portion of the settlement has been rebuilt or refurbished, and six residents live there year-round to greet tourist who venture down the Apache Trail. I blew into Tortilla Flat behind the rain and was welcomed by a few of the locals into their cozy and authentic establishments. The paved road continued on past Tortilla Flat for another 4 to 5 miles before it turned into a well-maintained, graded, dirt road. With the stormy weather and the potential for flooding, I decided to drive on until the asphalt ended so I could shoot a few more photos of the area before returning. On the road east of town I passed over a bridge above the quickly swelling Tortilla Creek. Two minutes up the road, I reached another bridge which crossed the creek, but this section was completely flooded with turbulent waters swiftly rushing across the road. It was too deep for me to drive through in the low-clearance rental car, so I turned back. 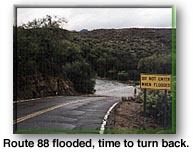 It took only two more minutes for me to reach the edge of Tortilla Flat before I realized that a flash flood had swept over the road I had just crossed minutes before. I was stuck, 50 yards from town, with the road washed out in front of me and behind me. There was no way the car could make it through the flooded road, so I got out and just stood there watching the flooded creek in shock. Here I was, alone in the desert, stranded on a small stretch of road, wondering what to do next. Suddenly, I heard a vehicle pull up behind me. It was a large road maintenance truck which had passed me earlier . It pulled over and when they understood my situation the crew offered me a ride across the flooded creek to Tortilla Flat. I gladly accepted and hopped in. Within a few minutes, I was inside the saloon and restaurant , sitting on a saddle of a stool, discussing the flash flood with a few of the residents. After an hour and a half of waiting, the rain started again. I quickly ran outside to look at the water level to see if it was passable. Most of the town and visiting tourists were standing by the creek still awed by the quick and powerful flash flood which had taken everyone by surprise. I wondered if this was the same gorge the flood of 1942 passed through. At this point, I could see the double-yellow highway lines, which meant the water level had gone down, so I decided to give it a try. It was sprinkling, which encouraged me to remove my shoes and socks and roll up my pants. The icy water was cold, but not too deep, so I waded across the road to the lone rental car I had abandoned not long before and successfully drove through the flooded road back into town. I was sorry to leave Tortilla Flat without exploring the 27-mile , graded-switch back road into Fish Creek Canyon, and on to Apache Lake, Roosevelt Lake, the Roosevelt Dam and Tonto National Monument. Even on the return to Apache Junction, the scenery along the road was spectacular. Each direction provided a vision of beauty -- dark volcanic rock, giant Saguaros silhouetted against the clouds, abundant chaparral and breathtaking mountains and gorges. I promised myself that one day, I would return and complete my journey down the Historic Route 88.